Patentees of the late D. of Norfolk's Lands. HODIE 3a vice lecta est Billa, for the reviving of a Statute, made Anno 22° Henrici Octavi, touching Powdyke in Marsh-lands, que communi omnium Procerum Assensu conclusa est. Eodem die, 3a vice lecta est Billa, for the Patentees of certain Lands of the late Duke of Norff. que communi omnium Procerum Consensu rejecta erat. Eodem die, 2a vice lecta est Billa, to take Clergy from Benedict Smythc, for the Murder of Rufforde. Prima, For the re-edifying of decayed House of Husbandry, and Increase of Tillage. Secunda, Touching the Town and Water of Stamforde. Tertia, Against the buying of Stolen Horses. 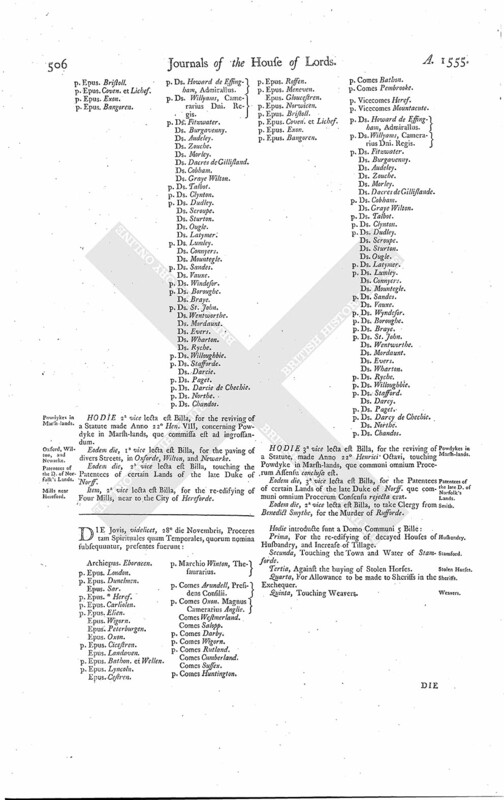 Quarta, For Allowance to be made to Sheriffs in the Exchequer.